Jim Brown was the greatest all around athlete in Syracuse University's history, and arguably the greatest in American history. He earned 10 varsity letters at Syracuse in four different sports (basketball, football, lacrosse, and track). At 6'2", 212 lbs, with a 29" waist, Brown was bigger, faster and stronger than most every other athlete he would encounter at every level of sports. A victim of racial attitudes of the times, Brown came to Syracuse in the fall of 1953 without a scholarship in hand and was the only black player on the freshman football team. In high school, Brown earned 13 letters including football (averaging 14.9 yards per carry), basketball (he averaged 38+ points per game), baseball and lacrosse. He played basketball his sophomore and junior years at Syracuse, averaging 13.1 points per game. He was a ferocious rebounder, and the best athlete on the floor. He would scored 33 points against Sampson Air Force Base his sophomore season, in a game he did not even start. Brown would not return for his senior season however, because he was not permitted to be a starter. 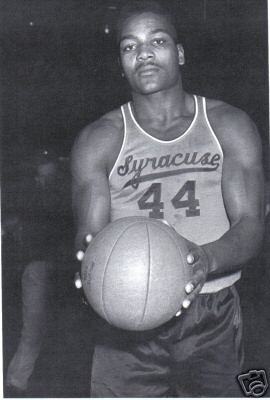 An unwritten rule at Syracuse prohibited the team starting three black athletes in basketball, and Syracuse had Vinnie Cohen and Manny Breland also on the team. Cohen believed Syracuse would have won the national title in basketball in 1957 if Brown had played with them; as it was, they lost in the elite eight. Brown's legend at Syracuse was in football, and he began the legend of #44. Brown was the ultimate running back, and also the place kicker on the team. He set standards in football that all future Syracuse players would be measured by. In a game against Colgate in 1956, Brown ran for 196 yards, scored 6 touchdowns, and kicked 7 extra points for a total of 43 points, an NCAA record that stood for over 40 years. His senior year he was a unanimous selection as an All-American and came in fifth place for the Heisman Trophy. He helped Syracuse get to the Cotton Bowl, where they lost a close game 28-27 to TCU. Brown is considered one of the greatest lacrosse players of all time. His senior season he led Syracuse to an undefeated season as the team went 10-0, and was co-leader of the national scoring championship. Brown was so dominant in the game, that they changed the rules requiring a lacrosse player to keep his stick in constant motion when carrying the ball. He was a two-time All American Midfielder. On occasion, he participated with the track team. In 1954 he finished fifth in the decathlon at the National AAU meet. He once competed in two sports the same day. On a warm May day in 1957 he wore his track suit, won the high jump and javelin, placed second in the discus, and helped Syracuse beat Colgate in a dual meet. Then he put on his lacrosse uniform and led the way to an 8-6 win over Army securing the undefeated season. He was a fantastic boxer. Roy Simmons Jr, the coach of the Syracuse boxing team thought Brown could have been the heavyweight champion if he dedicated himself to the sport. Brown didn't play baseball at Syracuse, but he could have. He threw two no-hitters in high school, and the Yankees had scouted him. Fortunately for Syracuse fans he turned them down. Brown was the 3rd pick in the 1957 NFL Draft by the Cleveland Browns. Brown made coach Paul Brown look like a genius by winning the Rookie of the Year award. Brown would play 9 seasons in the NFL, setting virtually every rushing record possible including most yards rushing in a season, must yard rushing in a career, most yards per carry, most rushing touchdowns, most total touchdowns. He was named to the Pro-Bowl all 9 years he played in the NFL, and he never missed a play in football due to an injury. He was the NFL's MVP four times (1957, 1958, 1963, and 1965), and led the NFL in rushing 8 of the 9 seasons he played. In 1965 he shocked the sports world by announcing his retirement from football, while at the age of 30 and at the prime of his career. Brown wanted to focus on his new acting career. He had just spent the spring filming The Dirty Dozen. Brown would appear in over 40 movies in his career including He Got Game, Any Given Sunday, and the Running Man. Brown has been involved in a variety of social causes in his career, aiming at providing young African-Americans with opportunities and keeping them on the right path. He has set up several different organizations on their behalf. Jim Brown racked up several honors. He is the only individual inducted into both the College Football Hall of Fame (1995) and the Lacrosse Hall of Fame (1984). He was inducted into the NFL Hall of Fame in 1971 in his first year of eligibility. He was named to the Walter Camp All-Century Team and was on the Syracuse University All Century Football Team.